Today has been my day off and I am not sure where time has gone! All of a sudden it was 4.30pm and still had the shopping to do- luckily the day was still light and sunny so I have a leisurely walk along into Twickenham and met Colin for the walk home. Because I was being lazy I had nothing particular in for lunch. 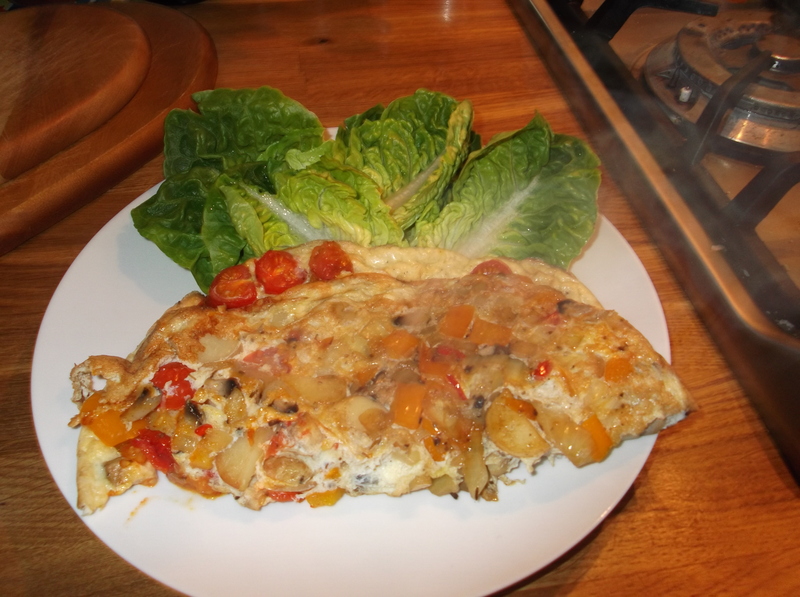 After an appraisal of the fridge I realised there was enough for a fabulous omelette! The photo may not make this look like the yummiest of lunches but it was! I sauteed some onion, mushroom, yellow pepper and cherry tomatoes until a little softened, but still a bit crunchy. I whisked 2 eggs mixing in a little grated pecorino (you could use any hard cheese, pecorino was all I had in the fridge!) and poured it all over the veg. I popped this under a hot grill for 5 mins until set. Served with a green salad and kept me full all day. For dinner we had one of our favourite meals- spaghetti bolognaise. Always yummy and always clean plates! Tomorrow is late night again. Colin is going to make a big chilli so that I have several in the freezer ready to take in for my late night dinners. Lovely.